Welcome back Commander! Command & Conquer The Ultimate Collection, a compilation of all 17 games in the selling real-time strategy franchise, is updated and will also give the strategy gamer maxumum pleasure. 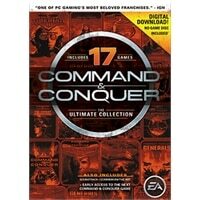 Command & Conquer The Ultimate Collection includes 17 game released in all three Command & Conquer universes. Make the most of every move as you order soldiers, vehicles, and aircraft across large maps filled with enemies, traps, and mission-critical resources. Move single troops, select small groups, or issue a unified attack order to all allies as you work to defeat the opponent. Success in battle requires more than just a keen battle strategy. Fight for control as you struggle to collect the resources necessary to build new bases, troops, and weaponry, all while keeping the enemy at bay. Explore the wide range of Command & Conquer games and fight every war from both sides! Rediscover the epic conflicts across two decades of gameplay. Take a first-person view of the C&C universe through Command & Conquer: Renegade – the series’ one and only first-person shooter – or start playing from the very beginning and enjoy the frenetic style of combat, immersive strategy and campy banter that launched a generation of strategy warfare games.